Reference number for this case: 16-Oct-54-Brioude. Thank you for including this reference number in any correspondence with me regarding this case. The weather station Albert Baldit in Chadrac (Haute-Loire) could observe yesterday evening from 05:50 p.m. to 06:35 p.m., with glasses, a luminous machine that appeared to have the shape of an olive supporting a black antenna at its top. 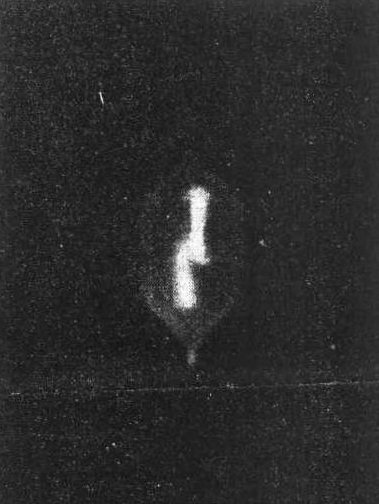 Moreover, observers noted that the object that threw very shining reflections of aluminium had a black trace at its third and two thirds. The station believed to have identified at the beginning of its observations the planet Jupiter, the largest of our solar system. But this machine which compared to north was 100° west changed color, with the setting sun, to become red and disappear in two minutes. Several people made the same observations from the place of Breuil while looking towards the Durande. It does indeed seem that is was the same mysterious apparatus which was observed at the same hour by the observatory of Rueyres (Cantal), by an employee of the EDF in Brives-la-Gaillarde and by the inhabitants of Brioude (Haute-Loire). [qh1] Article in the regional newspaper Le Quotidien de la Haute-Loire, October 17, 1954.